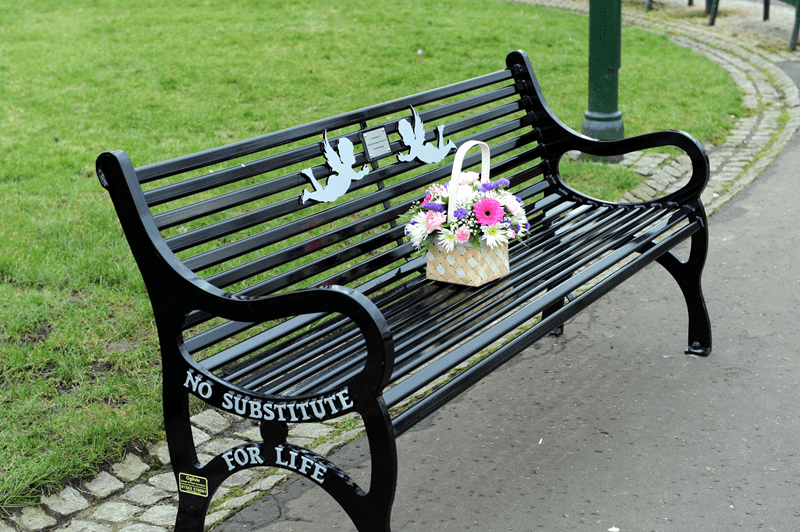 A memorial bench remembering those lost to suicide has been unveiled in Johnstone town centre. Renfrewshire Provost Anne Hall joined local resident Kate Sharkey to officially unveil the bench in the town’s Ludovic Square. Since the loss of her son Sean, Kate has devoted herself to ensuring Johnstone has a permanent place for residents to reflect on their loved ones. Through her dedication to help others face the issue, Kate has become a support to many in the Johnstone community. Kate is a member of Renfrewshire support group Survivors of Bereavement by Suicide (SOBS) which provides an outlet for those who need support. The group aims to overcome the stigma that surrounds suicide and encourages people to talk to others facing a similar situation. Despite the dark times that have followed Kate’s loss, she is determined to make the most of her life and the lives of her family. “You don’t get over it, you don’t. You learn to live with it and you learn to go through your life differently, adjusting. It’ll always be there, I’ll never forget him but at the same time he wouldn’t want me to be unhappy” she added. Provost Hall, who attends the annual memorial service held at Renfrewshire House, said: “Kate and the SOBS group have been incredibly committed to the creation of this bench and I’m delighted it has become a reality. If you, or someone you know, is having suicidal thoughts then please seek the support available. It really can make a difference. For more information on the Renfrewshire meetings of SOBS, call 0141 849 2200, or emailelizabeth.aitken@renfrewshire.gov.uk.